since you were good enough to find me. or something. Chumrahs – an earful, if you care for it. Aah, the chumrah. The subject of much debate. Here is what I have to say on the topic. When I was younger (circa shanah aleph) I would go off the deep end if anyone mentioned chumrahs around me and expected me to keep any. Of course, I’m sure I was on the chumrah bandwagon in some areas where I wasn’t even aware of it. Still, if anyone asked me to keep a CHUMRAH (ICK – they came in the same breath), I wouldn’t have it. Now I have come to a more thought-out stance. Nobody stone me here. Chumrahs have a lot in common with modern orthodoxy, which I find kind of ironic. I can talk about modern orthodoxy another time. Lets dwell on the topic at hand, shall we? As far as I can gather, chumrahs come from one of two places. 1 – Out of intense love for Hashem, we want to do even more than we are asked. Its a way of beautifying a mitzvah. 2 – When we don’t know what to do in a given situation, we err on the side of caution. (I.e. building a fence around the Torah). Then we have the problems. First off, I believe it was Rav Wolbe, z”l (who btw specifically requested, before he was niftar, that he NOT be referred to as “zt”l”) who said that in any given situation where there is more than one course of action, halacha comes into play. And if you don’t know or see that, it is because you don’t know halacha well enough. If this is the case, there are certainly going to be situations where we err on the side of caution, because (almost) no one knows all of halacha perfectly and so sometimes this is necessary. However, this is not the ideal, and we should exert as much effort as possible trying to learn and then implement what Hashem would like us to do. In addition, assuming this principle is true, another issue arises. If there is a halacha, a particular way to be behaving in a given situation, then all the OTHER ways of behavior are NOT correct. Rav Lawrence/Leib Kelemen, among others, has said that if someone is strict in one area, they are, by definition, being lenient in another area. He offers the (extreme) example of a young woman who takes it upon herself to say all of sefer tehillim each time she says birkat hamazon. The problem arises when she eats in her parents’ home, and while she is saying birkat hamazon AND tehillim, she misses out on an opportunity to be helping her parents clear the table and wash the dishes. It’s nice that she wants to be saying tehillim, but that is NOT what Hashem wants from her in that given moment. This type of situation addresses why #1 creates problems. Another problem that often arises is – it is assur to add to the Torah. Now, when a chumrah gets started, the person who thought of the thing either knows halacha well, or doesn’t. 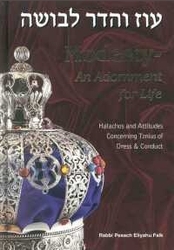 If you DON’T know halacha well, being machmir is only a temporary fix. Now that you know you have had such an issue, you have the opportunity to find out what the halacha is so next time you’re in such a situation, you’ll know what to do. If you DO know the halacha, you had better be careful when dealing with others and make sure they know that this is a chumrah and not halacha. Otherwise you are putting a stumbling block in front of a blind person, which, incidentally, is also assur. Especially when you are around someone who you both aknowledge knows less than you do. Chances are they are watching you to see what the CORRECT BEHAVIOR is. So you must explain. Another problem with chumrahs is as follows. If someone is trying to become frum, or to increase their Torah observance, this whole extra chumrah thing could be viewed as a burden. Rebbetzen Heller (yes, I’m quoting her again, I’m on a R. Heller kick lately!) says that if something is halacha, it is because Hashem considers it to be good for everyone (EVERYONE!) in that given situation. There are other things that are optional, gray area if you will, and those are good for some of the people, some of the time, and other people at other times, and never for the rest of them. If you have a fresh B.T., or someone traveling that path, and they see this huge boulder in their way, it could be a bit intimidating. OR a lot intimidating. They might even decide to turn around and walk the other way, or leave the path altogether. Now, if this boulder is halacha-related, so fine, its cool, they made their decision and they have to deal with the consequences, as Hashem put the boulder in their path. But if that boulder is a chumrah, and it was put there by an individual person (note – you’re not allowed to impose your chumrah on other people, its assur) or a community standard, then you are partially responsible for turning this person off. And that is a HUGE responsibility to have on your head. Very often when people take on chumrahs, you’ll notice that they are in external areas, i.e. tznius, kashrut, etc. [post on my inability to keep my pronunciations consistent for another time] and not in less public areas. (You might ask, “If they are in private areas, how would we know about them? Of course the public chumrahs get more publicity!” Well, its true. But I have heard lots of people asking their local rabbinic authorities countless questions about their spiritual paths, and chumrah-wise they generally include only external stuff. This ISN’T necessarily the case when people ask about straight-up halacha. which leads me to believe that a lot of times people are more concerned with appearing frum than with being frum. This puts people as the focus instead of Hashem, which pulls us AWAY from him. So we should really stop doing that. Now, there is value in having what I like to call the “frum jew handshake”, like when you’re at the mall, and you see a bunch of frum jews nearby, and you want them to know you’re frum too so you throw a “baruch Hashem” into your cellphone conversation just loudly enough that they hear you. It helps to create a closer-knit community in that it (hopefully) fosters love between fellow jews, and that is a good thing. But when it comes to mitzvah observance, it can take away from our doing the mitzvah lishma, for its own sake. Jew handshake story: When I was in college, in the very beginning, I wore huge wideleg skater jeans. I asked my rav what the deal was with pants for ladies, and he said that if pants are baggy enough that they don’t show the leg separation above your knees, the only problem is regarding minhag hamakom, which a – I wasn’t quite up to at the time, being a bit of a nonconformist I had real idealogical problems with the concept of minhag hamakom at the time, and b – it was college. There were, like, no frum jews. So darnit, I could walk around looking like a more fashionable version of M.C. Hammer if I wanted to (plus, it sent a clear message to the guys – “Can’t touch this…”). Back to the point at hand. If we get caught up in the “SEE HOW FRUM I AM” mentality, we are going to invest energy there that could have been better spent actually working on our relationships with Hashem. When chumrahs abound, people will spend time “working on” the chumrahs when they could have been working on an ACTUAL HALACHA that they have not yet mastered. I mean, come on, how many people actually make it through the day without speaking even one word of loshon hara or motzi shem ra? Just as a single example, I’m sure we could all come up with more. Now that I have dissed chumrahs as much as can possibly be, I will say the following. There IS a valid place for them. Sometimes we do need that fence around the Torah. (ie only listening to explicitly sexual music is assur. But I try not to listen to secular music that ISN’T sexually explicit because I find that it often puts me in a mindset where music challenges Hashem (ie – this song is amazing. I don’t want to shut it off and go daven mincha.) I don’t want to test myself in that way, I don’t want to put myself in a situation where music has a chance to become THE PRIORITY, so I don’t listen to it. I don’t watch TV because the shows on put me in a G-dless reality, even for a short amount of time, I become idiot zombie girl. Hashem likes us to think! My point in all of this is that chumrahs are sometimes appropriate if used sparingly and with a full head of brains. This entry was posted in Uncategorized and tagged chumrahs, college, frum community, frum jew handshake, halacha, Hashem, irony, jokes - I need to brush up on my delivery, looking frum vs. being frum, M.C. Hammer, minhag hamakom, mitzvot, modern orthodoxy, Pitfalls, problems, punk, Rav Kelemen, Rav Wolbe, Rebbetzen Heller, shana aleph, swami. Bookmark the permalink. 6 Responses to Chumrahs – an earful, if you care for it. Btw, I think the source for the lenient on the one hand but machmir on the other originated with R’Chaim of Brisk who was very meikil when it came to eating on yom kippur if the person was ill. When he was asked how he could be so lenient about yom kippur, he replied that far from being meikil about yom kippur, he was just very machmir about pikuach nefesh!! I used to envision my wedding as having a couple punk/ska bands at a concrete skatepark- preferably with a big street course. I was envisioning this Reel Big Fish or Face to Face version of Od Yeshama- which would totally fit- and instead of everyone dancing like retards ion a circle we would all be running around in circles trying to beat the crap out of each other. By the way due to my mediocre skating abilities- IE I can do shove its, 180s and kick flips- I took up trick biking and longboarding and continue to be one of the few frum yids who partakes in such sports. Yo TN 🙂 Thank you for that, I love sources and the more the better! FrumHiker (I still want to call you “Fine Dining”) it sounds like that was a plug for yourself. If you were a girl I’d ask you to teach me some skate tricks (going in a straight line on a flat surface would be a good place to start!) but you’re not so I can’t. One day perchance I will learn, unless babies interfere first. I have some music you should check out and review after the 9 days are up. You are SUCH a rebel. a fence around the Torah” usually refer to d’Rabbans? touch the tree, lest you die’ (paraphrase, gen 3:3). and take it as some personal mussar as well. non-religious (or slightly religious) as a shaliach? kind of special merit, right? Or not necessarily? Ploni and Ploniette are married. Ploni and Ploniette disagree have lots of preferences that are NOT in line with eachother’s. For example, lets say Ploni is really into having the toothpaste squeezed from the bottom, and Ploniette doesn’t care where she squeezes. She knows Ploni has his preference, but he’s not going to divorce her over the middle-squuzing, so she doesn’t bother to change her middle-squeezing habbits. At the same time, Ploniette likes the toilet seat to be left down (she once had an incident where she was in a hurry, didn’t notice that it was up, and fell in. Gross. ) Ploni knows this but he can’t be bothered to put the seat down when he’s done, especially since he knows that Ploniette doesn’t want to cause a fight, so she won’t say anything about it. More than that, Ploniette really likes cucumbers, and Ploni’s favorite veggie is tomatoes. They both don’t mind the other, but they prefer their respective veggies. They can only afford one type of veggie at a time, so on their individual days to shop, they get their personal favorite instead of the veggie that their spouse likes. They can get away with it, they’ll still have A relationship, but its totally not the same as the relationship between Fred and Marcia, where they have the same preferences as the above couple, but Marcia went out and got an extra temporary job so she could then buy a squeeze-it thingie so she would ALWAYS remember to squeeze the toothpaste from the bottom. And Fred went out and got a part time job so he could get one of those glowing toilet seats – he always makes sure to put the seat down but in case he forgets, the glow will allow Marcia to see that it’s open, even in the dark, so she won’t fall in. And he cleans the toilet daily, so that in case she falls in, its not that nasty. AND each of them buys their spouse’s favorite veggie, and saved the seeds and planted them in the yard so they could always have fresh ones, even when their spouse shops and buys the others favorite, the shopper will still have their favorite snack to eat. And they save a couple of seeds from their own veggie because they don’t want their spouse to feel bad that they don’t have the option to eat their favorite. OK that last bit was awkward, but you get the idea. We should run to do stuff Hashem wants us to do because we love Him and it makes Him happy and yeah. More to say, another day.